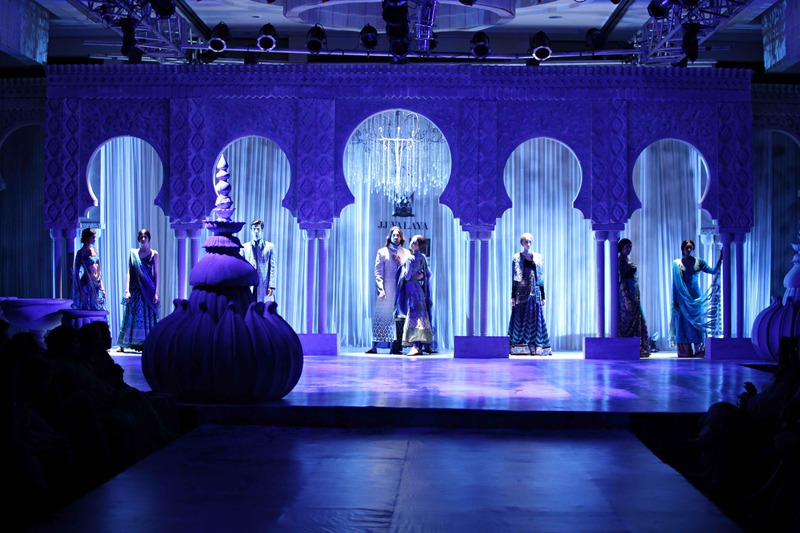 JJ Valaya’s couture collection was called The Azrak Collection, The Realm of The Sultan. Azrak translates as rare and uncommon from Turkish and we were treated to a colour palette and silhouettes invoking the glorious Ottoman Empire whilst showcasing the skills and dedication of the Indian master craft workers at his disposal. 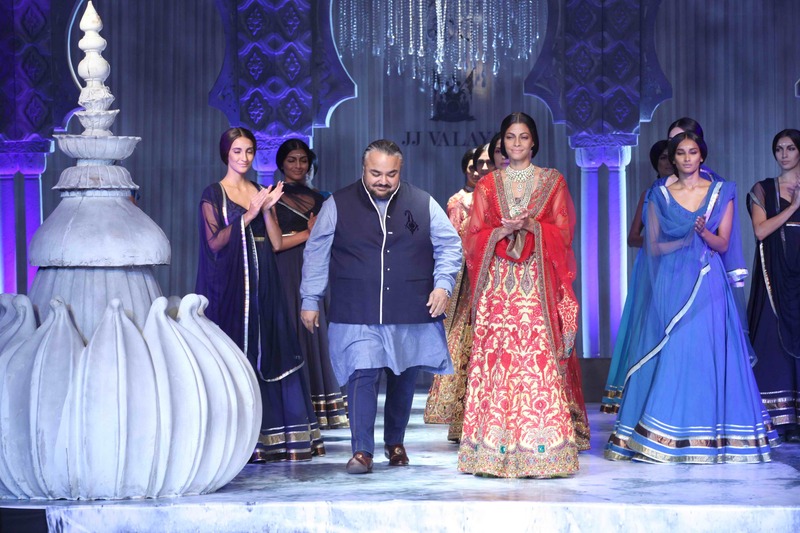 The essence of true couture is the hours of painstaking stitching and detail needed to produce each garment and JJ Valaya’s collection was exquisite. 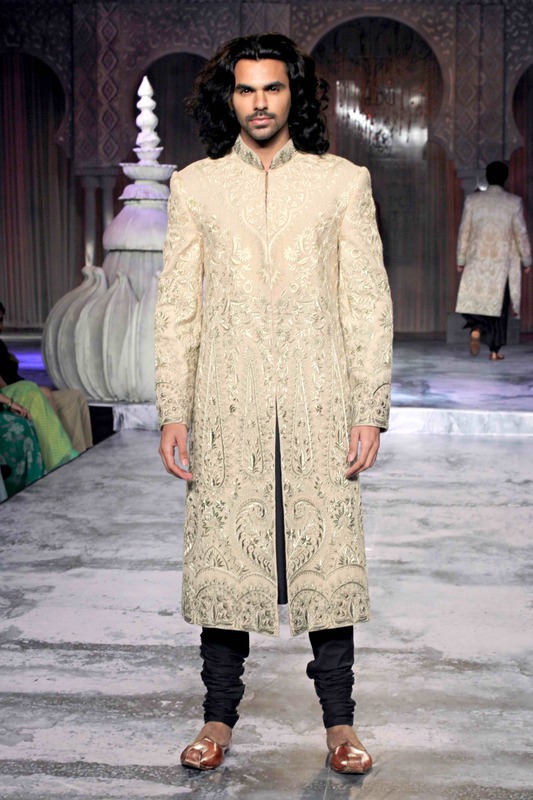 This collection was heavy on the embroidery and had a strong bridal/wedding trousseau undertone to it, however, this is in keeping with JJ Valaya’s speciality: creating the future from the past especially with reference to Indian royalty who continue to inspire the designer. The collection started with monochromatic colours of a misty morning of fog amongst the minarets and then like a perfect sunrise the rich turquoises, reds and gold break through the clouds. Fabrics such as Fine silks, Dupion, Jacquards, Georgette and Lush velvets embrace techniques ranging from metal work, Zardozi, Badla, Resham and semi-precious stone inlay to create a collection which attempts to provide a perfect blend of the past with cutting edge contemporary chic. The back of one sari top even included a Turkish miniature painting, now that is attention to detail! 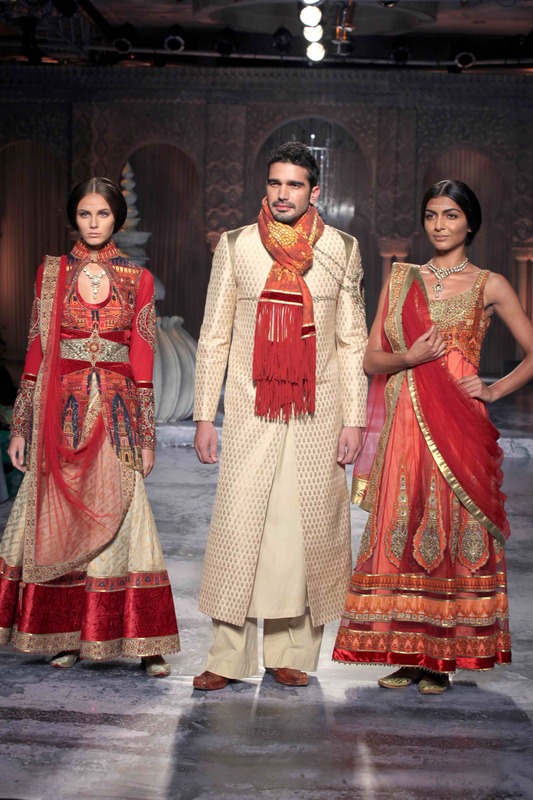 Celebrating the 20th anniversary of the JJ Valaya brand, the designer used the PCJ Delhi Couture Week 2012 platform to launch his Luxury Wedding service themed to tie in perfectly with the couture collection that was shown and my goodness it was an opulent and luxurious affair also showcasing the designer’s legendary wedding trousseau service. If I buy the coat does it come with the man? 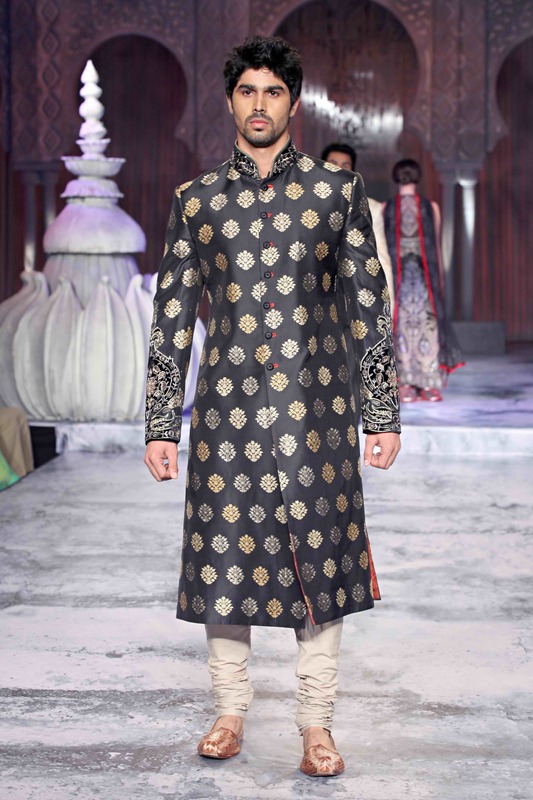 It’s nice to see Indian designers making things for guys too, they are too often ignored. The reason why guys are ignored is because they are boring to dress – see anything new up above for the boys ? No. Absolutely fabulous! It does look a little bridal but it’s not fair that only brides get to wear get pieces like this!